While the Silverado is perhaps one of the most recognized vehicles on the road, the Colorado makes up the second-half of the Chevy trucks being offered on the market in 2016. It was only released in 2014, but has already taken the midsize pickup truck market by storm, and unofficially crowned itself the master of this truck segment in 2015. With the competition still unable to come close to reaching the same type of quality and performance the Colorado offers at the end of 2016, it’s still the undisputed champ of the midsize truck world. With an imminent refresh coming for 2017 that is improving on the Colorado’s “weak” areas, the competition is going to be left even further behind. This truck went from zero to hero in just two years, by gaining recognition with Motor Trend Magazine, and winning their Truck of the Year Award for two years running in 2015 and 2016. The fact that Motor Trend was even astounded — and bewildered — as to how the Colorado won its Truck of the Year Award twice in a row should tell you how rare of an occurrence that is. Apart from that, it also shows Chevy’s dedication to giving the consumers what they want, and the ability to just build an all around great vehicle. With the refresh coming for 2017, could the Colorado be in the running to win this award again? It’s important to understand that Motor Trend’s Truck of the Year Award doesn’t just deal with midsize pickup trucks. Rather, it deals with full-size and HD trucks as well. That means out of all the commercial trucks on the road, the Colorado beat every one. But how could a truck that just had its first successful redesign in 2015 beat other more well-known vehicles like the Silverado, F-150, or Tacoma? Well for starters, Chevy managed to get the right combination of power and size down. It’s a midsize truck, but can also tow 7,000 pounds when equipped with the V6 engine and towing package. This is almost as much as a stock Silverado can tow, but with better fuel-efficiency and more nimble handling. In a nutshell, the first year it won the Motor Trend award is simply because it was an all around great vehicle, and no other truck could come close to touching it. It provided exceptional handling, good ride quality, and fuel-efficient, yet powerful performance at an affordable price. It all added up to providing more value than the competition, and that was the main reason it won over the hearts of the folks at Motor Trend magazine. Perhaps nobody was more confused than the editors and testers at Motor Trend when the Colorado won the Truck of the Year Award again the following year. The exceptional value, ride quality, handling, and everything else that let the Colorado win the Truck of the Year in 2015 remained. But, one thing changed — it got a diesel engine for 2016. 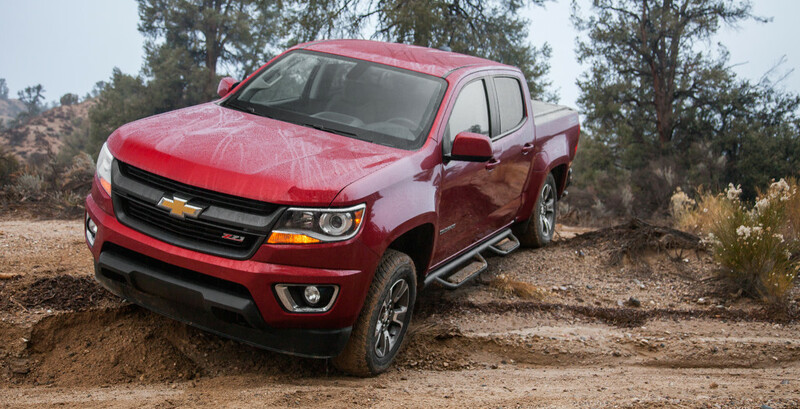 The 2.8-liter I-4 Duramax turbo-diesel engine is what pole-vaulted the Colorado ahead of the competition in 2016. Not only did it provide owners with a more durable and longer lasting engine, but also a much more fuel-efficient one. On top of it all, it was also able to outperform any other midsize truck on the market thanks to this new engine. Before we get into looking at the specs of this truck, it’s important to note that this diesel engine didn’t just provide the Colorado with better fuel-efficiency — it gave it the best fuel economy found on any pickup truck on the road. Whether it’s small, midsize, or full-size. Combine that with the positive qualities it had before, it’s no longer surprising that it trumped the competition again in 2016. That best-in-class performance mentioned earlier comes in many different flavors, and is spread across the Colorado’s three different engine options. These engines are the 2.5-liter I-4 engine, 3.6-liter V6 engine, and the 2.8-liter diesel engine. The 2.8-liter diesel engine is important to note, because it’s what gave the Colorado the capability to win the Truck of the Year Award in 2016. It puts out 181 horsepower, and has a best-in-class torque rating of 369 lb-ft. The towing capacity is also best-in-class, and now gives the Colorado a towing capacity of 7,700 pounds — which is more than the base Silverado can tow. Finally, the fuel economy is a highly impressive 22 mpg city and 31 mpg highway. While it costs a little bit extra for the diesel option, it’s obviously worth it. Especially since that fuel-efficiency doesn’t just beat the competition in the midsize truck class. It’s also the most fuel-efficient pickup truck (out of any size) to ever hit the market. Don’t rule out the two gas-powered engines the Colorado comes with either. The 2.5-liter I-4 engine gets best-in-class horsepower and torque, and puts out 200 horsepower and 191 lb-ft of torque. It also gets best-in-class fuel economy, which is 20 mpg city and 27 mpg highway. The 3.6-liter V6 engine also gets a best-in-class horsepower rating of 305, and is accompanied by 269 lb-ft of torque. The towing capacity is best-in-class compared to other midsize trucks, and sits at 7,000 pounds. The fuel economy? Again, best-in-class at 18 mpg city and 26 mpg highway. It’s clear the engines found on the Colorado are the truck’s strongest assets, next to the ride quality. So, how is the refresh in 2017 going to help put it ahead of the completion when all of its engines are already scoring three best-in-class ratings? To the dismay of the competition, the Colorado will be receiving a new V6 engine and eight-speed automatic transmission. While figures are unknown, the combination of these two parts is going to create a powertrain combination that is (again) unmatched in 2017. Which means it’s going to leave the competition in the dust, and perhaps win over the hearts of the staff at Motor Trend for a third year in a row. Both the engine and transmission have been calibrated to create a combination that emphasizes refined performance, ultimately optimizing the fuel economy. Based on the route the diesel engine took, it’s safe to assume that the prospect of a more optimized and effective engine and transmission combination will outperform the competition. As far as design goes, there isn’t any talk of that yet. But based on the past couple of years, any other changes made can only be positive. Based on the evolution of the Colorado just from 2015 to 2016, it wouldn’t be surprising to see the 2017 model make the pickup truck segment its stomping ground for a third year in a row.